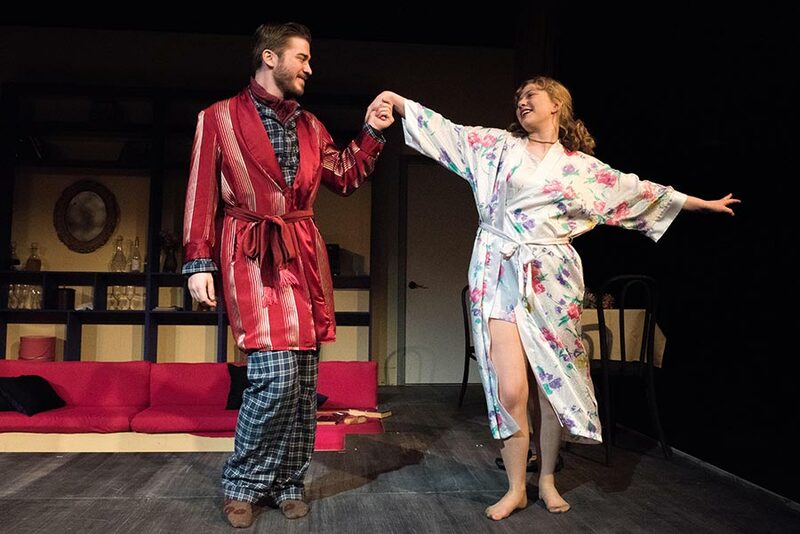 Theatre students Chase Atherton (left) and Caleigh Zwahlen perform in "Private Lives." Stage play “Private Lives” took off like a rocket, selling out its first performance on Thursday, Sept. 27, at Cal Poly Pomona. “Private Lives” was penned playwright Noel Coward in 1930 as a three-act comedy of manners satirizing the society of its time. White, however, is injecting the characters’ same style into the present day. While constructing his vision of character existing outside of their time, White says he made a list of a number of people he felt fit the bill, but that he also referenced a particular photo of Audrey Hepburn. The renowned mid-century actress, White says, embodied the notion of having a 1930s high-society style out time, having been an infant when “Private Lives” first took to the stage. “Private Lives” performs at 8 p.m. on Sept. 27, 28, 29, Oct. 4, 5, 6 and 2 p.m. on Oct. 7. For more information and tickets, visit www.bit.ly/cpptndtix.